Over the past decade LinkedIn has become the world largest professional network and today it counts over 560 million users. You’ve probably heard plenty about Linkedin already; you probably know by now that it’s extremely important to have a personal account on the social media platform, because first of all it’s a great way to promote yourself and your skills, as it basically acts as an online resumé that can reach millions of people, and secondly it’s a well known fact that many companies research you via social media before or after a job interview/meeting. So we presume that you are very cautious with your personal LinkedIn page, keeping it well organised, publishing interesting content, connecting with other professionals and growing your network. So if your personal page is so important, why are a lot of companies still missing out on a Business LinkedIn profile for their businesses? We prepared this article with the intention of describing the benefits of having a LinkedIn Business page, and to do this we have come up with the top reasons why you should create one today. So let’s start. First of all it promotes your business. By default a business profile is public and visible to all LinkedIn users, so you need to make sure that the content you share is honest and engaging, as it directly affects your company’s SEO (LinkedIn is considered to be one of the best platforms for lead generation). Secondly, employees become free ambassadors of your business; by adding a company to his ‘Experience’, it automatically connects with your company business page. This means that their connections will see their updates and it increases the chances that they will click on the link to your page. LinkedIn also offers you a chance to measure the activity and efficiency of your updates. Any time you post an update it will automatically be displayed on your followers’ timelines, by them liking it, commenting on it or sharing it, the update will be automatically displayed on their timeline and their followers will be able to see it too. On each update you will be able to see the statistics of how many clicks, likes and impressions it generated in total. This is a great way to keep track of your company’s LinkedIn engagement. Additionally, apart from everything mentioned before, we can’t forget that LinkedIn is above all a professional network, so it’s the perfect platform to publish job offers, connect with other professionals and look for new clients, connections or sponsors. Just like Facebook and Instagram, LinkedIn also offers the possibility of promoted posts. By paying a small amount, LinkedIn will help you reach a specific audience/region/target market and in this way engage more people and promote your company to a wider market. Do you think you are now convinced that you need to set up a LinkedIn business page today? If you still don’t have one, you can contact us and our professional will help you with this task. We will make sure your page looks professional and organised, or if you already have one but don’t think it’s reaching its potential we will help you manage and promote it. 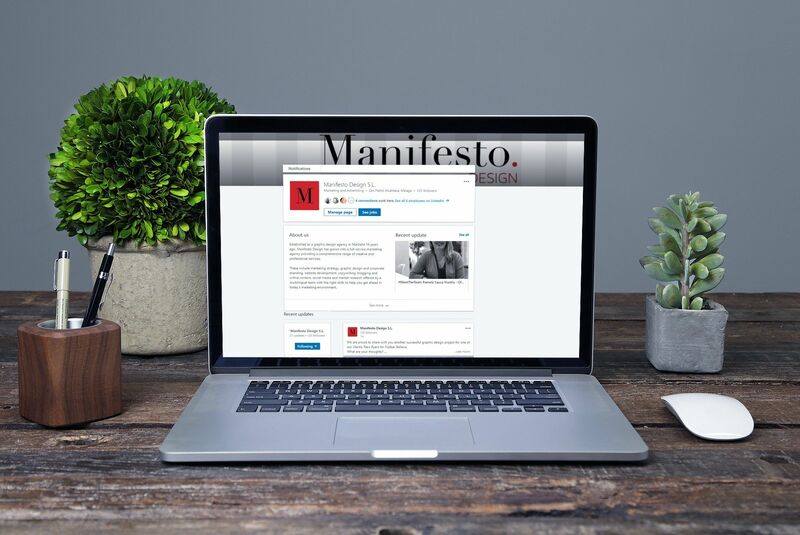 Engage Manifesto and grow your business.